Dehghan Lotfabad, A., Movahedirad, S., Sadeghi, M. (2016). Bubble formation on a single orifice in a gas solid fluidized bed using digital image analysis. Iranian Journal of Chemical Engineering(IJChE), 13(1), 60-72. A. Dehghan Lotfabad; S. Movahedirad; M.T. Sadeghi. "Bubble formation on a single orifice in a gas solid fluidized bed using digital image analysis". 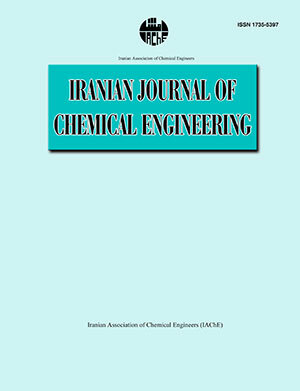 Iranian Journal of Chemical Engineering(IJChE), 13, 1, 2016, 60-72. Dehghan Lotfabad, A., Movahedirad, S., Sadeghi, M. (2016). 'Bubble formation on a single orifice in a gas solid fluidized bed using digital image analysis', Iranian Journal of Chemical Engineering(IJChE), 13(1), pp. 60-72. Dehghan Lotfabad, A., Movahedirad, S., Sadeghi, M. Bubble formation on a single orifice in a gas solid fluidized bed using digital image analysis. Iranian Journal of Chemical Engineering(IJChE), 2016; 13(1): 60-72. Digital Image Analysis (DIA) has been employed to characterize the time evolution of a bubble injected from a single orifice into a pseudo 2-dimansional gas-solid fluidized bed. The injected bubble diameter increased with the square root of time before detachment. During bubble free flight in the bed, its diameter remains approximately constant. The center of mass of the bubble increases with the second power of the time. The results show that the classical models for bubble injection can predict the time evolution of bubble diameter, and its center of mass. Bubble tends to elongate during injection and after detachment its height to width aspect ratio decreases. Image analyzing results used also for the study of gas leakage from the bubble to emulsion phase, and it has been shown that the dense phase expands up to 1.04 times of the minimum fluidization condition for large bubbles. The expansion ratio of the dense phase increases linearly with bubble diameter. 1. Dehnavi, M. A. Shahhosseini, S. Hashemabadi, S. H. and Ghafelebashi, S. M., "CFD based evaluation of polymer particles heat transfer coefficient in gas phase polymerization reactors", Int. Comm. Heat Mass Transfer., 35 (10), 1375 (2008). Marschall, K. J. R and Mleczko, L., "Experimental Investigations of Catalytic Partial Oxidation of Methane to Synthesis Gas in Various Types of Fluidized-Bed Reactors", Chem. Eng. Technol., 23 (1), 31 (2000). Dosta, M. Antonyuk, S. and Heinrich,S., "Multiscale Simulation of the Fluidized Bed Granulation Process", Chem. Eng. Technol., 35 (8), 1373 (2012). Movahedirad, S. Molaei Dehkordi, A. Banaei, M. Deen, N. G. van Sint Annaland M. and Kuipers, J. A. M., "Bubble Size Distribution in Two-Dimensional Gas–Solid Fluidized Beds", Ind. Eng. Chem. Res., 51 (18), 6571 (2012). Movahedirad, S. Molaei Dehkordi, A. Abbaszade Molaei, E. Haghi, M. Banaei, M. and Kuipers, J. A. M., "Bubble Splitting in a Pseudo2D Gas - Solid Fluidized Bed for Geldart B-Type Particles", Chem. Eng. Technol., 37 (12), 2096 (2014). Kuipers, J. A. M. Prins, W. and Van Swaaij, W. P. M., "Theoretical and experimental bubble formation at a single orifice in a two-dimensional gas-fluidized bed", Chem. Eng. Sci., 46 (11), 2881 (1991). Sun, L. Zhao, F. Zhang, Q. Li, D. and Lu, H., "Numerical Simulation of Particle Segregation in Vibration Fluidized Beds", Chem. Eng. Technol., 37 (12), 2109 (2014). Olaofe, O. O. van der Hoef, M. A. and Kuipers, J. A. M., "Bubble formation at a single orifice in a 2D gas-fluidized bed", Chem. Eng. Sci., 66 (12), 2764 (2011). Movahedirad, S. Dehkordi, A. M. Deen, N. G. van Sint Annaland, M. and Kuipers, J. A. M. H., "Novel phenomenological discrete bubble model of freely bubbling dense gas–solid fluidized beds: Application to two‐dimensional beds", AIChE J., 58 (11), 3306 (2012). Movahedirad, S. Ghafari, M. Dehkordi, A. M., "Discrete Bubble Model for Prediction of Bubble Behavior in 3D Fluidized Beds",Chem. Eng. Technol., 35 (5), 929 (2012). Movahedirad, S. Ghafari, M. and Dehkordi, A. M., "A Novel Model for Predicting the Dense Phase Behavior of 3D Gas‐Solid Fluidized Beds", Chem. Eng. Technol., 37 (1), 103 (2012). Bokkers, G. A. Laverman, J. A. van Sint Annaland, M. and Kuipers, J. A. M., "Modelling of large-scale dense gas–solid bubbling fluidised beds using a novel discrete bubble model", Chem Eng Sci., 61 (17), 5590 (2006). Nieuwland, J. J., "Hydrodynamic modelling of gas-solid two-phase flows" Ph.D. Thesis, Twente University, Enschede, The Netherlands. (1995). Nieuwland, J. J. Veenendaal, M. L. Kuipers, J. A. M. and van Swaaij, W. P. M., "Bubble formation at a single orifice in gas-fluidised beds", Chem. Eng. Sci., 51 (17) , 4087 (1996). Verma, V. Padding, J. T. Deen N. G. and Kuipers, J. A. M., "Bubble formation at a central orifice in a gas–solid fluidized bed predicted by three-dimensional two-fluid model simulations", Chem. Eng. J., 245, 217 (2014). Huttenhuis, P. J. G. Kuipers, J. A. M. and van Swaaij, W. P. M., "The effect of gas-phase density on bubble formation at a single orifice in a two-dimensional gas-fluidized bed", Chem. Eng. Sci., 51 (24) ,5273 (1996). Rong, L, Zhan, J. and Wu, C., "Effect of various parameters on bubble formation due to a single jet pulse in two-dimensional coarse-particle fluidized beds", Adv. Powder Technol., 23 (3), 398 (2012). Harrison, D. and Leung, L. S., "Bubble formation at an orifice in a fluidized bed", Chem. Eng. Res. Des., 39 ,409 (1961). Yang, W. C. Revay, D. Anderson, R. G. Chelen, E. J. Keairns, D. L. and Cicero, D. C., "Fluidization Phenomena in a large-scale, cold-flow model", in: Kunii, D., Toei R., (Eds. ), Fluidization IV, Engineering Foundation, New York, p. 77 (1984). Zenz, F. A., "Bubble Formation and Grid Design", Inst. Chem. Eng. Symp. Ser., 136, 136 (1968). Caram, H. S. and Hsu, K. K., "Bubble formation and gas leakage in fluidized beds", Chem. Eng. Sci., 41 (6), 1445 (1986). Busciglio, A. Vella, G. Micale, G. and Rizzuti, L., "Experimental analysis of bubble size distributions in 2D gas fluidized beds", Chem. Eng. Sci., 65 (16), 4782 (2010). Busciglio, A. Grisafi, F. Scargiali, F. and Brucato, A., "On the measurement of bubble size distribution in gas–liquid contactors via light sheet and image analysis", Chem. Eng. Sci., 65 (8), 2558 (2010). Asegehegn, T. W. Schreiber, M. and Krautz, H. J., "Investigation of bubble behavior in fluidized beds with and without immersed horizontal tubes using a digital image analysis technique", Powder Technology., 210 (3), 248 (2011). Caicedo, G. R. Marqués, J. P. Ruı́z, M. G. and Soler, J. G., "A study on the behaviour of bubbles of a 2D gas–solid fluidized bed using digital image analysis", Chem. Eng. Process. : Process Intensification, 42 (1), 9 (2003). Bokkers, G. A. van Sint Annaland, M. and Kuipers, J. A. M., "Mixing and segregation in a bidisperse gas–solid fluidised bed: a numerical and experimental study", Powder Technol., 140 (3), 176 (2004). Geldart, D., "Types of gas fluidization”, Powder Technol., 7 (5), 285 (1973).